If there’s a particular event you’d like to see next year, please let us know via email at anth.head@ubc.ca. Events are also posted on the Digital Signage and board in ANSO foyer. Drawing from posthumanist, decolonial and Indigenous literature, this lecture considers the concept of the Anthropocene in relation to sacred Himalayan landscapes. Bringing questions raised by the species-thinking designation of the current epoch anchored in the West into discussions of Himalayan environments, the presentation opens pathways for co-production of knowledge without erasing marginalized voices. Join us for this year's President's Lecture, "Capacity, corporeality, containment: Boundary maintenance and social exclusion in Malaysia and Australia" with Lenore Manderson, a professor of Medical Anthropology in the Faculty of Medicine, Nursing and Health Sciences, and the School of Political and Social Inquiry at Monash University, Australia. Reception will follow lecture at 5:30 PM. Exact location of talk to be announced. Accelerated consumption of minerals, oil and energy as well as the development of infrastructure to make them available for consumption, has led to an unprecedented destruction of what we know as nature. Joining protests in defense of the environment some indigenous collectives have made public that what is being destroyed is other-than-human entities, crucial participants in world-making practices that confuse the division between nature and humanity. In these dynamic essays (University of Utah Press, 2017) thirteen scholars explore the ways in which spiritual and cultural paradigms have shaped their vocations as teachers, scholars, mentors, and advocates and how these approaches have been integral to their life’s work, not merely to their work life. These insightful testimonies narrate the relationships of career, family, students, patients, and colleagues, weaving them together rather than compartmentalizing them. The University of British Columbia (UBC) Department of Anthropology is pleased to announce Amplified: Voices, Landscapes, and Belongings, a poster conference that brings to the forefront new and cutting-edge research by emerging academic voices from across the Pacific Northwest. For this colloquium Wylie will be outlining a long-term research program that leverages work she has done on evidential reasoning and collaborative practice in archaeology. It consists of three interrelated projects that, together, constitute key elements of pragmatic and proceduralist account of objectivity as knowledge “fit for purpose”: knowledge that is empirically well-grounded in a non-foundational sense, that has survived critical scrutiny informed by relevantly diverse standpoints, and it is accountable to purpose. In this colloquium Wylie will outline what she has in mind as the point of departure for what she envisions as, itself, a collaborative venture. Join the Himalaya Program for a community forum that involves visiting scholars: Jeevan Baniya, Subin Mulmi, Dinesh Paudel, and Deepak Thapa. Please note that this discussion will be held in Nepali, with Q&A to follow. This event is free and open to the public. Light refreshments will be served. This event is supported by a SSHRC Partnership Development Grant held by Anthropology faculty member Sara Shneiderman. Nepal’s Prolonged Transition: End in Sight? Join the Himalaya Program for a lecture by Deepak Thapa, director of the Social Science Baha research institute in Kathmandu, and a well-known political analyst and commentator. The talk will discuss whether Nepal's political transition is coming to an end, and what the contours of the Nepali state are likely to be in the future. This event is free and open to the public, and will be followed by a reception. This event is supported by a SSHRC Partnership Development Grant held by Anthropology faculty member Sara Shneiderman. Join us for the the Green College speakers' series: Worlds of Wonder: People Making Places Sacred. 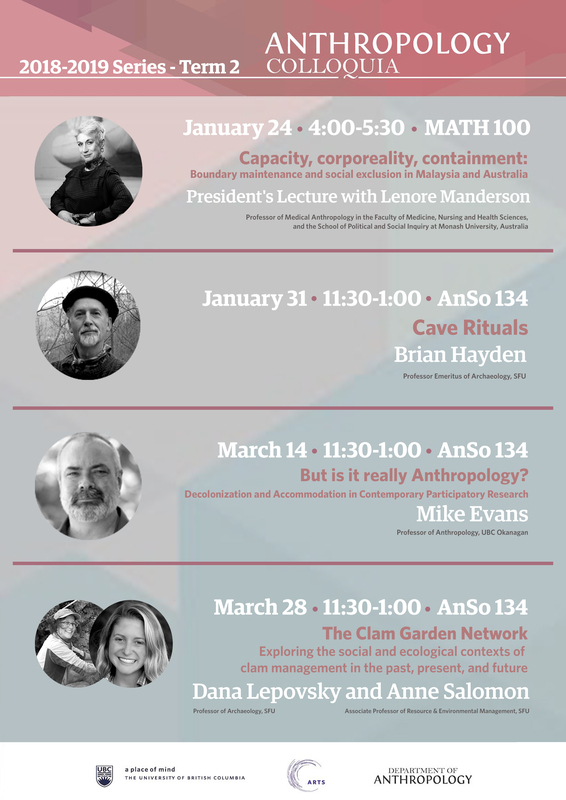 The first two talks feature scholars from UBC Anthropology: Michael Blake, and Stolo elder, Albert (Sonny) McHalsie. Click to read more about the series events. For time immemorial, the Stó:lõ people have understood the enduring connection between time, space, and the material/spiritual realms. Land, water, the heavens, and all living things are interconnected with names, histories and spirit. This talk explores and describes how this ancestral knowledge can be traced over thousands of years—connecting buildings, monuments and locations still visible on the landscape with practices, place names and histories that are taught to the Stó:lõ youth of today. The speakers discuss how Stó:lõ archaeological and historical research carried out during the past thirty years has helped bring some of these connections to light and how Stó:lõ communities are working to protect their tangible and intangible heritage under constant threat of erosion by the settler culture and practices. To all the new graduate students – welcome to the UBC Anthropology graduate program! The Department of Anthropology is excited to meet everyone and we wish you a smooth transition into the new school year. The Graduate Student Orientation on Tuesday September 5, 2017 will ensure that you are well prepared for your graduate studies in Anthropology. The transition to agriculture is one of the most important developments in human history. However, in spite of more than 100 years of research on the "agriculture revolution" we do not yet fully understand this process. North China is one of the primary centers of independent agricultural development, and the Fuxin project is an attempt to locate pre-agricultural and early agricultural sites in this region, chart the development of human society and understand the economic adaptation of prehistoric communities. It is a multi-scalar effort drawing on regional, community, and even household level analysis, and the project is also interdisciplinary. Speaker Gideon Shelach-Lavi is the Louis Freiberg Professor of East Asian Studies and the director of the Institute of Asian and African studies at Hebrew University. He is an archaeologist specialized in the Neolithic and Bronze Age of north China. Who owns the past? Museums that care for the objects of history or the communities whose ancestors made them? Five decades ago, Native American leaders launched a crusade against museums to reclaim their sacred objects and to rebury their kin. This controversy has exploded in recent years as hundreds of U.S. tribes have used a landmark federal law to recover their looted heritage from more than one thousand museums across America. Presenting a new book, Chip Colwell shares his personal journey to illuminate how repatriation has transformed both American museums and Native communities. New Developments in Anthropology – On The Horizon is a poster session hosted by Department of Anthropology, with introduction by Dana Lepofsky, Simon Fraser University. Potluck dinner provided by the UBC Anthropology Department and the Anthropology Graduate Student Association. Join us for Archaeology Day 2017, Saturday March 18th, 8:30 - 4:30 PM. The day will consist of 11 talks, including a Keynote Speech by Joel C. Janetski, and 2 poster presentations. Free breakfast and lunch included, open to the public. How do human beings attune themselves to the subtle, ambiguous, and invisible? Are there ways of training ourselves to listen, see, and sense more acutely that will allow us to learn about the inner worlds of others? In this presentation, I will describe non-destructive methods for the identification of mammalian hair with examples from two case studies. In the first study, a single human hair was discovered among museum-curated megafaunal hair specimens from the Colorado Plateau dating to between about 10,400 and 13,600 cal BP. The second case study is a sample of probable human hairs identified among the large quantities of bison hair in the Promontory Caves, Utah (AD 1250-1290). Although we have made some improvements toward a different kind of anthropology, one which is embodied, the investigations of the body and performance have ultimately remained on the margins of the discipline. Drawing from my ethnographic-participant fieldwork with North Indian tabla players and the teaching of ethnomusicology labs at an American University, I argue for a turn to what Sarah Pink (2009) has called sensory ethnography. Dr. Zitzewitz' research focuses on the different ways that Indian artists—both Hindu and Muslim—have inhabited the secular space of the art world during and after the rise of fundamentalist politics. She is beginning a new project on the contemporary art of India and Pakistan, the first installment of which will be curated exhibitions at the Eli and Edythe Broad Art Museum at MSU. This talk discusses how Tibetan medicine remains at once a crucial form of local health care across Tibetan communities, a manifestation of national identity, and, increasingly, a globally available form of ‘traditional’ medicine in the 21st century. It is co-sponsored by The Himalaya Program. Click here to see their event listing. The Angyaaq was nearly lost to time and it is museum collections that have kept this knowledge alive and allowed the Sugpiat to relearn and put this knowledge back into a living context. In 2014 we made models and then in 2015-16 we constructed two full-sized functional Angyaak. This project shows the value of museum collections to tribes and vice versa. Focusing on beauty work, Dredge Byung’chu Kang (Assistant Professor of Anthropology at the University of California), shows how embodying Koreanness consolidates the achievement of white Asian status while continuing to perpetuate the marginalization of those with dark skin and low social status in Thailand. Location: ANSO 134 Click here to download a PDF of the colloquium poster. Dr. Charles Menzies' People of the Saltwater is a combination of personal narrative and ethnographic monograph. This talk explores the complication, advantage, disappointment and enjoyment involved in writing home: both in the sense of writing home to an audience familiar with the subject matter and writing about home to an audience unfamiliar with the place, people, and history. Anthropology Colloquia: Dr. Dana Lepofsky, Professor of Archaeology, Simon Fraser University. Faculty, students and staff can get to know each other. For Undergraduate & Graduate students, Faculty & Staff. A welcome for new and returning undergraduate students. The 2013 Annual Conference of the Canadian Anthropology Society/Société canadienne anthropologie will be held from May 8-11, 2013, on the beautiful campus of the University of Victoria in Victoria, B.C. Click here for more information.